The idea may send your eyes rolling skyward: Water the grass while you're taking a shower. Feed the apple trees while you brush your teeth. But for some homeowners, their water is not just going down the drain – it's being reused for other purposes, like getting pumped directly to the roots of their fruit trees. Any water that has been used in the home, except water from toilets, is called grey water. Dish, shower, sink and laundry water comprise 50 to 80 percent of residential "waste" water. As homeowners, we make a lot of it each day – according to the EPA, an average family of four uses 400 gallons of water per day and over 140,000 gallons during a year. That's a lot of water running down the drain. Because of this, water shortages are becoming a big concern in the United States. Since homeowners make so much grey water each day, it makes sense to re-use it. Much of the water used is clean enough to easily be treated and reused for non-potable (non-human consumption) purposes, such as gardening, flushing toilets and clothes washing. According to the EPA, approximately 50 percent of the water households use annually can be recycled and reused. Good for you, your water bill and good for the environment, especially in areas where water is scarce. Scaling back the amount of water you flush into treatment facilities lessens your share of the chemicals and energy used to process your city's water. Or, if you use a septic system, recycling wastewater will help extend the life of that system. Grey water recycling and harvesting of rainwater is common in much of the world – "not necessarily in Alaska, but I think we will begin to see it," says Jack Hebert, President/CEO of the Cold Climate Housing Research Center in Fairbanks (CCHRC). Hebert is also a Fairbanks homebuilder who is incorporating dual plumbing systems into new homes, which use recycled water for flushing and landscape irrigation. Hebert says that the CCHRC is heading towards reusing all the water that is generated there. "What we are working on here is taking the discharge water and treating it further so it suits drinking water," says Hebert. "We want to exceed the expectations of drinking water." Currently, approximately 1800 gallons of delivered water, along with a system that captures seasonal rainwater, is reused for toilet flushing, sprinkler systems and landscaping. Changes in plumbing-system design can allow grey water to be separated from black water and run into a treatment system for reuse. Installing grey water systems in new homes during construction is much easier than retrofitting existing homes. According to the Department of Housing and Urban Development, the initial cost of installing a grey water reuse system in a new home ranges from approximately $500-$2,500, depending on local code requirements for the treatment of grey water. Properly designed grey water systems have the potential to dramatically reduce reliance on freshwater, and to pay for themselves over a reasonable period of time. With around one-third of indoor water use going down the toilet, reusing sink and shower water for flushing is an obvious improvement. One company, Brac Systems, offers an off-the-shelf system for less than $2,000, complete with piping and a choice of tank sizes for the reuse system. The System is designed to receive grey water (such as bath/shower/laundry water), filter and treat it, and then send it, on-demand, for toilet flushing. For maintenance, just clean the filter every few weeks, and add a chlorine tablet every six weeks. "There are lots of areas in our state and other states that are water poor because it is not available for periods of time or because it is very expensive," says Dan White, with the Institute of Northern Engineering at the University of Alaska Fairbanks. More arid places like Southern California and Arizona have been using grey water in their toilets for flush water and for landscaping for a long time. "From a homeowner's standpoint, if water costs are a concern," says White, "then there is an easy way to alleviate them: capture grey water and then run it back through the toilets." Not ready to invest in a full-fledged grey water recycling system? 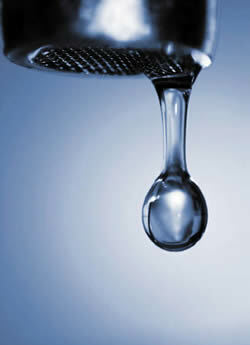 There are many common places in your home where you can conserve water yourself. Your plants don't necessarily need fresh water, and actually, some additives in grey water can help them grow. Also, try capturing rainwater in a barrel – the naturally mineral-free water is ideal for gardens and window washing.